Hi and happy Monday House Mouse lovers. 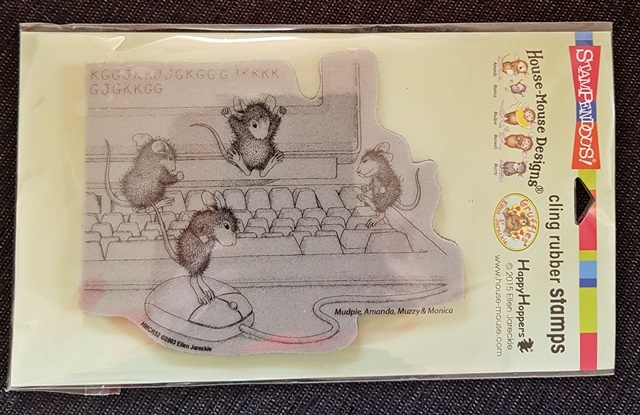 Just remember to use a House Mouse, Gruffie or Happy Hopper image. CD collection images and or any decoupage by House Mouse Designs! Mousey Design &Stampendous Designer blogs. on the challenge blog in order to qualify for a prize...easy peasy! 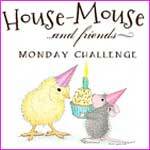 the House Mouse & Friends Monday Challenge. is made with a Sizzex die. for the LOVE/VALENTINE blog hop. to see what a wonderful creation she has made. Wat een prachtige kaart met een schattige afdruk. The colors are beautiful for a "love" card. And as always the image from house mouse: I love them ! OK this is just adorable. I have this stamp and have never gotten my candy box to look this cute!! Awesome job!! 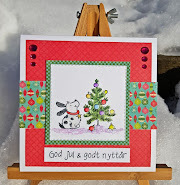 It is a super cute image, and I love how you colored it up, Dorte, and the pretty border die cut. Perfect stamp for our challenge theme too. Super cute image love your coloring and pretty card design! Awe ... so very adorable! Thanks so much for playing in our ‘Use the color RED’ challenge at Dies R Us. Good Luck and please come back again soon! Hi Dorte adorable sweet image, hop this cute hopper finds his fav choccys. lol super CAS card great work teamie. Eeek! So cute Dorte! Your pretty background papers and shapes, with the darling image - it's all so happy and full of mischief! Wonderful card! What a fun blog hop! Just adorable, Dorte, as always! Thank you so much for sharing with this sweet HappyHoppers image! This is just adorable. There isn't any better word for it! What a sweet, sweet way to wish someone a happy Valentine's day! Thanks for joining our "USe Red" challenge at Dies R Us! Such an adorable card! Love the House Mouse. Lovely card! I can totally relate diving into the chocolate box. Sweet image. What an absolutely adorable card. I love the scallop at the top and the button accent. That sentiment of congratulations is so perfect. Who wouldn't love a box of chocolates for a congratulation gift. Love your card. The bunny in the chocolate box - that would be ME! I LOVE your adorable card, with the beautiful, soft color palette! Very pretty! Aww, that naughty bunny! So adorable - a super sweet Valentines, for sure. Thanks so much for playing at Sunday Stamps! Look at that Happy Hopper with his little tush in the air tucking into the chocolates! So cute! I swear, with some of my typos those little guys jump on my keyboard more often than I can count! Hahaha! Adorable card. Hope some chocolates are left for you! Hi Dorte, I am so glad I found your beautiful blog via HM challenge. Your card is adorable, my friend. I love the cute HM image and the design. Kisses from Greece, my dear lady. And thank you so much for the chance to win such a great prize. Great card with that naughty bunny, Dorte...so sweet! Aaaw that bunny is so cute and I LOVE chocolates!! that sweet bunny is a little naughty! But so lovely!! Very pretty card! Such a cute image and a darling card. I was thinking that was me eating up the chocolates. So glad you joined us at Die Cut Divas. Loving the pretty CAS layout of this Dorte! Perfect Valentine! Dette var et flott og dekorativt kort. 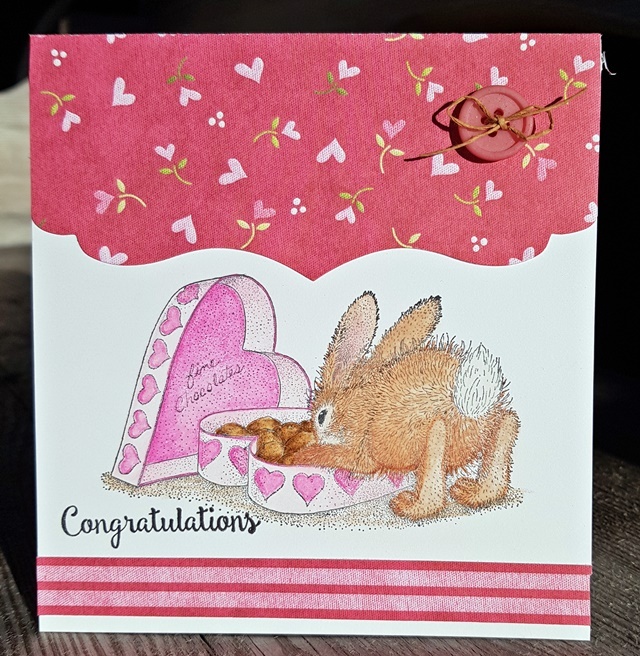 Awww...gorgeous card Dorte...love that cute bunny bum! This is such a super adorable card!! As I have a real sweet tooth, I can totally relate to this bunny digging into a box of chocolate! Love the shaped element and wooden button too. Awwww, this is just super adorable! That little bunny couldn't be cuter. Such a sweet card, Dorte. Lovely creation. Lovely card. Such a sweet hopper image. amazing coloring! I used the same image but my coloring is not as good as yours :)! What a beautiful project !! Beautiful coloring and the design !! It's great to have you with us here at Incy Wincy Design, I hope to see you again at our next challenge !! Such a cute little bunny ... Thanks for sharing at Scrap From Your Heart. I wish you the best of luck in the challenge.